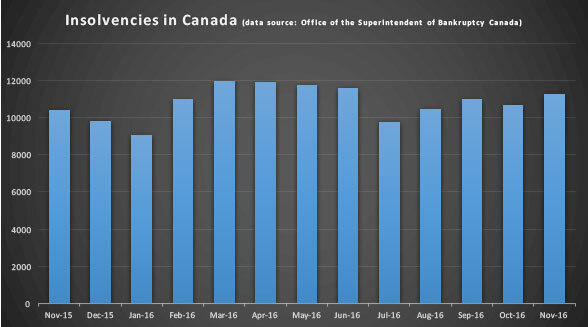 Consumer insolvencies in BC in November 2016 increased overall by 12.4 percent from October, 2016. Consumer proposals increased 11.6 percent while bankruptcies increased 5.3 percent. The proportion of proposals in consumer insolvencies in BC increased to 60.0 percent during November while they account for 49.9 percent of all 2016 consumer insolvencies. 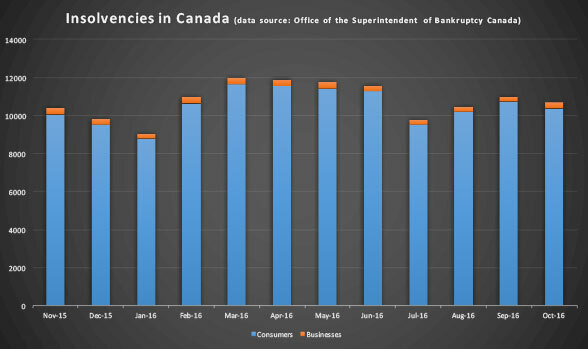 Consumer insolvencies in BC for the 12-month period ending November, 2016, decreased overall by 5.6 percent compared with the 12-month period ending November, 2015. Consumer bankruptcies decreased by 23.3 percent, while consumer proposals increased by 11.6 percent. The proportion of proposals in consumer insolvencies in BC was 56.4 percent during the 12-month period ending November, 2016, up from 50.1 percent during the 12-month period ending November, 2015. Again, it indicates the popularity of consumer proposals as a way for consumers to deal with their debt over bankruptcies and other non-legislated options. For the 12-month period ending November, 2016, consumer insolvency filings accounted for 97.0 percent of all insolvency filings. See this article for other Canadian insolvency stats for November 2016.